Objective: The aim is to present current clinical practice of thoracic aorta screening in a tertiary referral center. We identified how often imaging techniques were used for screening and established the value of transthoracic echocardiography (TTE) in comparison with computed tomography (CT) to detect aortic dilation. We also investigated which additional abnormalities of the heart, aorta or smaller arteries were discovered. 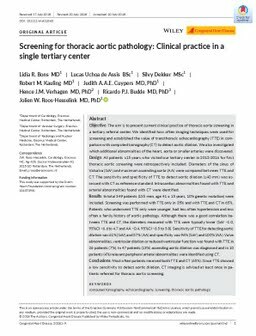 Design: All patients ≥15 years who visited our tertiary center in 2012-2016 for first thoracic aortic screening were retrospectively included. Diameters of the sinus of Valsalva (SoV) and maximum ascending aorta (AA) were compared between TTE and CT. The sensitivity and specificity of TTE to detect aortic dilation (≥40 mm) was assessed with CT as reference standard. Intracardiac abnormalities found with TTE and arterial abnormalities found with CT were identified. Results: In total 349 patients (155 men, age 41 ± 15 years, 10% genetic mutation) were included. Screening was performed with TTE only in 35% and with TTE and CT in 65%. Patients who underwent TTE only were younger, had less often hypertension and less often a family history of aortic pathology. Although there was a good correlation between TTE and CT, the diameters measured with TTE were typically lower (SoV −1.0, 95%CI −6.6 to 4.7 and AA −0.4, 95%CI −6.5 to 5.8). Sensitivity of TTE for detecting aortic dilation was 61% (SoV) and 57% (AA) and specificity was 96% (SoV) and 100% (AA). Valve abnormalities, ventricular dilation or reduced ventricular function was found with TTE in 26 patients (7%). In 47 patients (13%) ascending aortic dilation was diagnosed and in 10 patients (4%) relevant peripheral arterial abnormalities were identified using CT. Conclusions: Most often patients received both TTE and CT (65%). Since TTE showed a low sensitivity to detect aortic dilation, CT imaging is advised at least once in patients referred for thoracic aortic screening.